Terex Part - Terex Forklifts stands by their mission to supply a consistent and cost effective product line. They take satisfaction in manufacturing equipment that improves their customers' earnings. Through many divestures and acquisitions planned to expand the product offering, Terex has recently expanded dramatically. They have improved their geographic coverage to make it possible for them to present quality standards and value for their broad customer base. Terex has remained a competitive player in the materials handling and industrialized equipment sector. They are working towards forming a franchise under the name brand Terex by incorporating all of their preceding brand names for many of the products used in conjunction business the brand Terex. 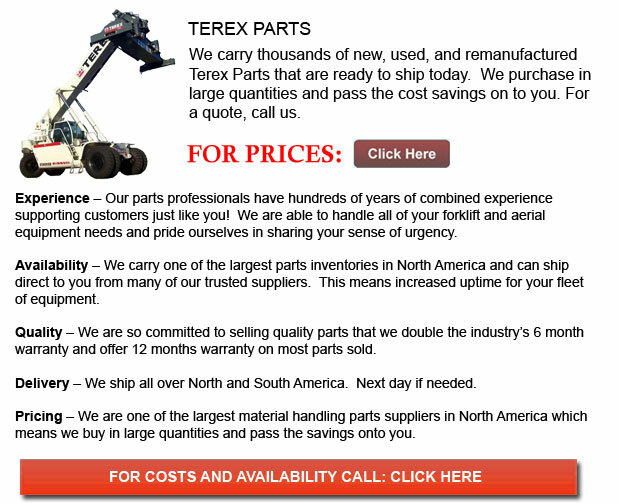 Currently, Terex goods are principally marketed under the Terex name. Several of the following historic name brands and transitional names include: ATC, Amida, American Truck Company, American, Advance, Bartell, Benford, Bendini, Bid-Well, CMI, CMI-Cifali, CMI Johnson-Ross, Cedarapids, Canica, Comedil, Demag, ELJay, Franna, Fermac, Finlay, Fuchs, Genie, Hi-Ranger, Jaques, Load King, Morrison, O&K, Peiner, PPM, Powerscreen, Pegson, Reedrill, Schaeff, Simplicity, Standard Havens, Tatra, TerexLift, Telelect and Unit Rig. Terex has shown steady progress, purchasing PPM Cranes, in 1995 while divesting Clark Material Handling in 1995. In 1997 Terex acquires Telelect and Simon-RO. BPI Handlers in Baraga, Michigan is also acquired this same year. Buying O&K Mining and Payhauler in 1998, enabled Terex to mature their mining operations. The same year their crane offering expanded their operations significantly with the acquisitions of Gru Comedil, TerexLift, American Crane and Peiner. A Light Construction business soon followed in 1999 when Terex acquired Amida, Bartell and Benford. They soon became a leader within the crushing and screening industry by purchasing Cedarapids, Powerscreen, BL Pegson, Re-Tech, and Finlay. Franna, Kooi and Princeton crane suppliers were also added to Terex in 1999. By the year 2000, Terex expanded into the Compact Equipment industry, buying Fermac who is a manufacturer specializing in tractor loader backhoes. Their Light Construction operations continued to expand business with the acquisition of Coleman Engineering. This same year, Terex divested Moffett, Kooi and Princeton. In 2001, Terex expanded their Roadbuilding division business with the acquisitions of CMI, Bid-Well, Load King, Atlas and Jaques. Several acquisitions in 2002 placed Terex along with the leaders in their respective categories. Terex became an important crane business as Demag fills out the Terex Cranes product offerings. Advance Mixer places Terex within the concrete mixing industry. Acquiring German manufacturers Fuchs and Schaeff positioned Terex in a top position in the Compact Equipment class. Genie became a primary producer of Aerial Work Platforms. This busy year was completed business with the purchases of EPAC and Pacific Utility, which offered company-owned circulation for Terex Utilities. A company called Tatra was purchased in 2003. This company created heavy duty vehicles for military and off-road industrial purposes. Acquiring Combatel and Commercial Body the same year allowed Terex to continue to expand its company-owned Terex Utilities supply. In 2004, Terex acquired Reedrill, a producer of surface drilling equipment for application within the construction, utility and mining markets. Noble CE, which was known as Terex Mexico was also acquired this year. They produce high capacity surface mining vehicles and also fabricate many parts for other Terex businesses.